Food assistance recipients in Ethiopia. Severe drought caused by one of the most powerful El Niño events in recent history is wreaking havoc on farmers and their families across Africa and the world. Millions of people are affected by the drought and in need of food assistance. The food security situation is rapidly deteriorating, as low rainfall negatively impacts maize crops—a staple part of a standard diet in the area. The United Nations World Food Programme estimates that almost 60 million people globally have been affected by El Niño. In Malawi alone, six million people are in need of food aid. The impacts of this emergency are likely to last until the next harvests start in 2017. But in the midst of crisis, there is hope. 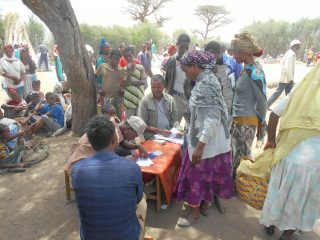 In Ethiopia, PWS&D has contributed $30,000 to partners at Canadian Foodgrains Bank who are providing emergency food rations of maize, beans and oil to 41,000 people. About 14,000 of those receiving assistance are nursing and pregnant women, and children under the age of five. Stories of the impact this response is having can be found here and here. In Malawi, Balaka and Nsanje are among the districts hardest hit by the crisis and have experienced significant decreases in crop production. Food access is generally quite restricted due to high prices and very limited income generating opportunities. PWS&D is working with partners to begin implementation of a food assistance project targeting the most vulnerable—including children, elderly, chronically ill, and pregnant and nursing mothers. You can make a donations to PWS&D’s drought response through your church, by mailing a cheque to the office, donating online, or calling 1-800-619-7301 x291. For just $50, a family of five receives one month of food rations in Ethiopia. Please give today.